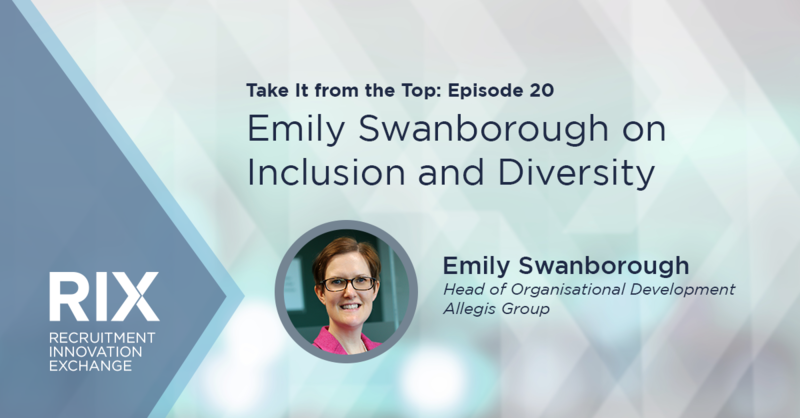 This week Emily Swanborough, Head of Organisational Development at Allegis Group Limited, joins Loick Pires, Manager of Enterprise Research & Strategy at Bullhorn, to explain what recruitment firms can do to increase diversity in the workplace. RIX: Welcome to take It from the Top, a podcast from RIX by Bullhorn. I’m joined here by Emily Swanborough. Thanks for joining us. Emily is the head of organisational development at Allegis Group Limited and she joins us today to discuss a wealth of topics, thanks again for joining us. Emily, the natural first question is, could you please tell me about your background before getting in to recruitment? Emily Swanborough: First off, thank you so much for inviting me here today. It’s a total pleasure to be able to come in and talk. I know we’re going to be focusing on a couple of different topics, I&D amongst them and it’s a journey for us, a total journey. We by no means have all the answers, but we love it when we get the opportunity to come in and talk. My journey pre-recruitment is pretty much nonexistent, to be honest. Allegis Group is the only place I’ve ever worked, bar the university summers, which we’re not going to go into any detail on [laughing]. It’s 15 years this year I’ve actually been with Allegis Group and I’ve stayed with the organisation for that amount of time for a couple of different reasons. One is the opportunity that it’s provided me to grow and develop, but also the people that I work with and the relationships that I’ve built, I would genuinely struggle to name an area of my life that hasn’t been in some way shaped by my time with Allegis Group. RIX: I’m guessing you’ve seen lots of changes from personnel and a technology perspective as well? Emily Swanborough: I’ve seen a huge amount of change and it’s only really when you stop and take a look back that you realise just how much has changed because when you’re in the moment and you’re in the minutia of constant change, but little gradual change, it’s only really when you put a mark in the ground and say, “What was this organisation like when I joined?” There’s a photo hanging around the office somewhere back in Bracknell with all of the 60 or so people at the very first sales conference I attended. We have single departments in EMEA that are larger than that. Growth has been significant, it’s only really when you stop and look back that you can truly appreciate just how far we’ve come. RIX: Absolutely, and obviously moving forward for yourself, how did you get into organisational development? What led you to that path? 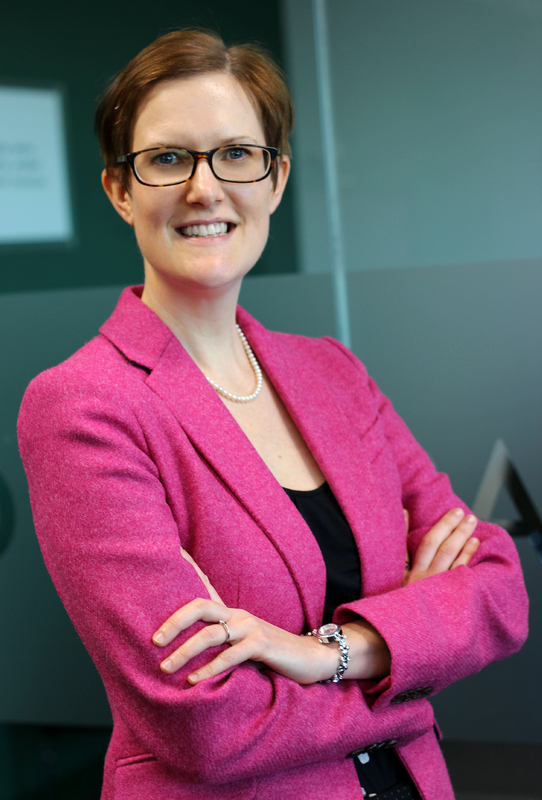 Emily Swanborough: I’ve been afforded some fantastic opportunities with Allegis. I came in as a CSA, so associate level, working to onboard our contractors and I’ve been offered a lot of opportunities to move around the organisation – always with a focus on people, managing or building out large teams. The move into organisational development was an opportunity to do that on a larger scale. It was about wanting to make a difference, wanting to start something new, resolve business challenges, be a part of building something from scratch, a bit of a blank canvas, and very much an opportunity for me to learn and to grow at the same time. RIX Absolutely. That’s excellent. The main reason we brought you in today was to discuss Inclusion & Diversity. 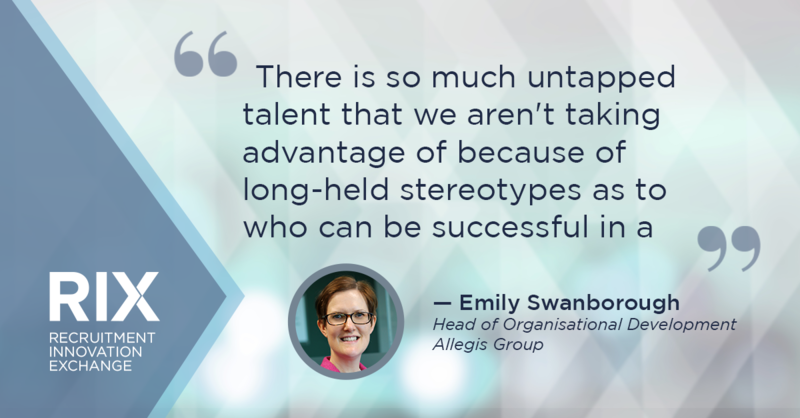 How has Allegis Group been involved in combating the global diversity problem in the recruitment industry? Emily Swanborough: Yeah, that’s a question to start with! [laughing]. Allegis Group has over 35 years of experience in helping organisations tackle their most pressing talent needs, and we recognise the part that we can play, the part that we should play, in improving the diversity in the workforce for the clients across the different industries that we serve. And actually, we’re doing a lot. I&D is about continuous improvement, so there’s always going to be additional things that we can do, but as we continue on the journey there are a couple of different things we are doing right now. First up to mention is that we publish some thought leadership white papers, those are available on our global website. We do those on a couple of different strands of I&D and we make these available across all of our social media channels. So these are accessible to anyone at any point who wants to learn more or understand more about this topic. I’ll go with one of the recent ones about talent business and competition, which was really about providing an informed foundation that can help companies who are interested in this topic move their conversation forward. It’s about helping both talent and business leaders understand what the issues are, ask the right questions, and from there consider the implications. That’s pretty much the first thing that we’re doing. Secondly, across Allegis Group we have a three pronged approach to I&D. We’ve got some global consistency, but we’ve also got flexibility at a more local level. And those three prongs are really around workforce, workplace, and marketplace. Workforce is about the diversity of the talent that we’re bringing in. Workplace is about the inclusive environment within which we then engage with them, and marketplace is really about building partnerships and creating awareness in the communities and markets that we serve. It’s definitely a couple of different things that we’re doing there in terms of understanding the external challenges. We’re also doing some pretty neat things around supporting the development, predominantly through investment of technology that’s looking to help fight bias through the talent acquisition process. RIX: Our recent Global Recruitment Insights & Data (GRID) research found that while 59 percent of firms agreed that diverse organisations are more effective than other ones, only 41 percent said the recruitment industry has a diversity problem. From your own personal experience, what directly contributes to a lack of diverse diversity in staffing and what needs to change? Emily Swanborough: Those are interesting stats. It’s a really broad question and actually, what it suggests is that staffing is alone as an industry struggling with diversity challenges. In fact, you can look at a whole host of different industries and pick holes in their diversity credentials as well. Whether it’s IT, legal, HR, nursing, or teaching, sales, in general, has historically been fairly male-dominated. That is the original culture. All of this has the opportunity to change and this is the journey that we’re on. It would be really easy if you were starting today, but we’ve got to fix history, which makes it much harder and that takes time. There is so much untapped talent that we aren’t taking advantage of because of long-held stereotypes as to who can be successful in a sales role. And our clients are diverse, and having a diverse workforce allows us to engage appropriately. If you have clients who are driving a more diverse way of thinking, we have to be mirroring that. We have to be supporting them and we have to lead by example. In terms of what needs to change, I think it already is changing. I genuinely think those stats will be different from what they were five years ago, and I think even 12 months from now they will be different again. I genuinely think it is changing. It takes time. It is a generational thing and you can’t change 35 years of history overnight. That change has to start with leadership. They’re responsible for mindset, culture, being role models, for hiring, but there is so much energy and momentum behind these initiatives nowadays, I just think that you can’t hide from them. We’ve been lucky. We have really strong leadership engagement and sponsorship and that has made all of this a lot easier. RIX: This topic is typically referred to as diversity and inclusion, but you’ve spun it to inclusion and diversity. What was the reason? Emily Swanborough: Yeah, subtle isn’t it? I&D versus D&I [both laughing]. It actually took us a while to get used to it. Now I can’t imagine saying it the other way. We changed that at the end of 2017, so we’ve just done pretty much our first full year as an I&D committee versus D&I. It comes from the fundamental belief that inclusion has to come first. We can’t bring diversity into an environment that it’s not going to thrive in. It’s just not going to work. A lot of the things that we have focused on over the past 12 months have been about how we can drive the inclusion element across our organisation in the belief that diversity will more naturally follow if we get that right. RIX: And what kind of effect did this have on the business, both internally and externally? Emily Swanborough: In time I think it’s given us a lot more focus in terms of what we can control. The culture within an organisation is within our control to change. For example, I think we’ve focused a lot more on our people managers, we ran a people manager development day last year that recognised that corporate initiatives are great and they have their part to play, but the biggest impact on people when you bring them into the organisation is the manager at the desk that they sit at and the immediate culture within which they are brought into. Inclusion starts with our people managers. Having that focus has allowed us to set that direction much more easily. RIX: Often, companies who try to set up an inclusion and diversity initiative hire external consultants. In your experience in running initiatives, do you prefer to keep it in house and upskill those people in managerial positions or have you ever got external help to try to add more focus on inclusion and diversity? Emily Swanborough: We’ve never brought anybody in. We love to learn. We love to partner. We love to bring in speakers. Having said that, we did actually partner with Mind, so we did have them come in and work with us on a day that we built. We gave them a specific slot and said we wanted to do more to support our managers who were dealing with teams who were suffering from mental health problems. We bring in experts every now and again, but we set our direction. We set our strategy and we believe that we know our people and our I&D strategy is very much built in response to what is relevant to us at any given time. What are we trying to drive? What are we trying to achieve? And therefore, what should we be doing to know? No, we’ve never gone particularly external. RIX: With the way you’re doing things, it is brilliant to see and I think it’s something that will catch on elsewhere in terms of how you’re focusing on the inclusion first, making sure it’s an environment that works and then diversity will follow. What does the future hold for you just from an I&D perspective? Emily Swanborough: Probably more of the same. I think that 2018 was our most successful year yet. It really feels like we had our biggest impact. We have the sponsorship, the commitment, the buy-in, and the platform. It’s really just continuing to make sure that we listen to our people and the feedback from organisations. We get lots of feedback around what we’re doing. What lands, what doesn’t, what we could do more of, and what we could do less of. Mostly because we’ve demonstrated in the past that we respond to feedback. We do get a lot of that. But really, it’s about engaging more broadly, making it even more relevant, and asking and listening to what people want. RIX: What do you feel is the biggest obstacle to embracing diversity from a workplace perspective? Emily Swanborough: A couple of different things. It’s about time, resources, balancing the pressure on our leaders to perform with the pressure to diversify their workforce. For example, hiring, we still have our own personal business challenges in accessing a more diverse talent pool. 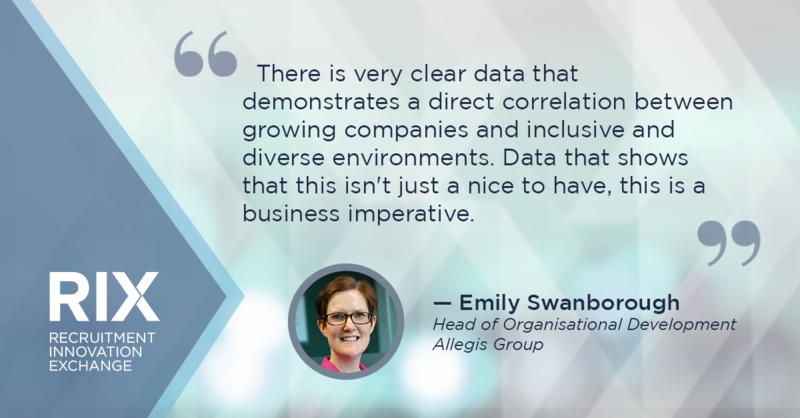 And actually last year, and again this year, hiring at Allegis is a focus of the committee and it’s allowing us to really assess the diversity mix that come in for interviews so we can really understand where our diversity mix gets challenged. Is it at the job description stage? Is it when candidates will come into a certain office and see a male-dominated environment? We have seen leaders across our business making positive shifts towards challenging themselves more to find the right candidates. For example, including a female in the interview process, or making sure that we have a 50/50 candidate mix. But we know that we can do more across our offices and we are committed to doing that. RIX: And I can see that already. I’ve got a scenario based question for you. If you were to walk into a room and an executive didn’t think that a lack of diversity was a real problem, what would you say to him and why? And why should staffing leaders care? Emily Swanborough: It’s a great question and it isn’t even a hypothetical because those executives do exist and they do hold their views, as you shared the stats earlier. They’re a product of the history. They are a product of their professional upbringing. We can’t blame them. It’s a generational thing. And actually, I think what those attitudes really show us is how far we’ve come because there were days when that was the majority. I think nowadays they are the minority. Certainly the minority within Allegis Group. However, if they continue to think like that, there is no doubt they will get left behind. They will literally get left behind. There is very clear data that demonstrates a direct correlation between growing companies and inclusion and diversity, and inclusive and diverse environments. Data that shows that this isn’t just a nice to have, this is a business imperative. But even beyond that, beyond the business level, this is right on a human level; we have to keep talking and educating those who don’t believe. This is ultimately about attracting diverse talent, about improving retention, and maximising the value and the contribution of every single employee. We do recognise it might take longer for diverse teams to get up and running. You’ve got to figure out how to work effectively with people who are different from you. It is going to take that team longer to gel then a group of identical people with identical mindsets. It may well be slower in the short-term to get diverse teams up and running and the data supports that. But long-term, through things like diversity of thought, through innovation, through spotting and resolving risks, through productivity and even through better representation of their customers, their results will be better. And you know what? If you’re in that minority and you’re not interested in the human piece, you know that’s your choice, but you simply cannot argue with data that shows that I&D drives better results. RIX: I’d like to move on to discuss upskilling for leadership. Our GRID research found that 74 percent of global recruitment firms believed that reskilling workers represented an effective strategy to combat the perennial skills shortage as it would help to create new talent pools, fill key roles, and transform lives. In which reskilling and upskilling initiatives is Allegis Group involved? I know there’s a few. Emily Swanborough: It’s an interesting question. What do we do to prepare the people that we have in the business today, for what is coming tomorrow. Leadership development, as you called it, has been a real focus for us in recent times. In 2017 we launched our own program aimed at equipping our leaders with a broader range of leadership skills to help them be the best leaders that they can be. This was not in any way about giving them greater technical skills. This was very much focused on making them great leaders. What are the behaviors that they need to be demonstrating and how can they make that shift from where they are today to where they would like to be tomorrow.? We had great feedback on that too. It was a really personal course in terms of focusing on where any individual was in that moment, in their own personal journey. What do they need? What did they want to focus on? We have received really good feedback for that and leadership development continues to be a priority. RIX: How does Allegis Group approach leadership buy-in and training employees to become leaders? Emily Swanborough: I’d be hard pressed to name a leader in our sales business that didn’t start as a recruiter and work their way up. It’s people that have come through the organisation who have seen the processes and done the role and are now playing a part in shaping the organisation for the future by having seen where it’s been in the past. RIX: And you’re a shining example of that. In terms of next steps and lessons and advice, how did the dynamic of being prepared for leadership play out in your own life in career? Emily Swanborough: I love the assumption there that I was in any way prepared for leadership [both laughing]. I have learned my lessons. I have made my mistakes. I have had tough feedback. I said at the beginning that there wasn’t an area of my life that hadn’t been in some way shaped by my time at Allegis Group, and it is through that feedback and it’s through those lessons with the focus on the culture and the people that we have within the organisation and through the incredible relationships that I’m here today and I’m continuing to learn. RIX: Based on your journey, what are some lessons for anyone trying to follow in your footsteps? Emily Swanborough: I would say be yourself. Totally be authentic. Be very clear on the value that you bring and the contribution that you make. What is your own individual contribution and make sure that you can articulate it because if you can’t, why can anybody else? Literally be clear on what you’re bringing, be curious. Learn as much as you can, seize opportunities, whether they are relevant or whether you think they are where you had intended to go next. There’s a reason and you will take something from it. You will learn something from it. And love what you do. Life is too short not to. RIX: What does the future hold for you? Emily Swanborough: The only thing I have ever wanted to do was make a difference and have an impact, and I can’t imagine any reason why I wouldn’t still be doing that at Allegis Group because they’ve always offered me the opportunity to make a difference and then have an impact. Hopefully, I’ll continue to do that in a meaningful way in five to 10 years. RIX: Well, it’s been an absolute pleasure talking to you, Emily. You’ve joined us on Take It from the Top here at RIX.